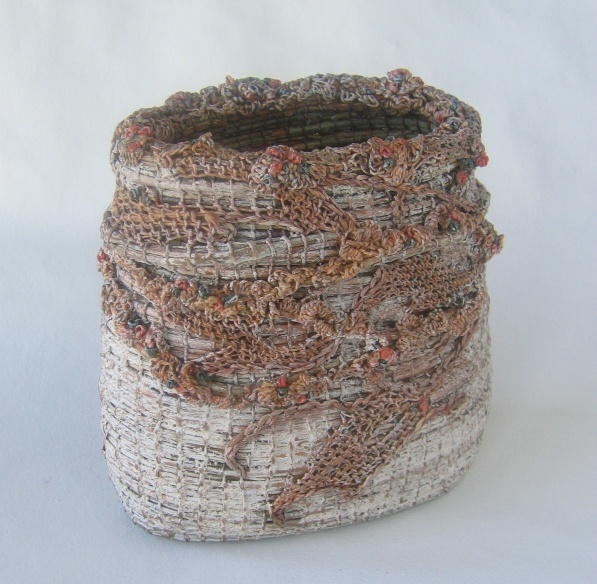 Willow, the material used as the core element in this coiled vessel, has a long and fascinating history. Our ancestors even used it to construct the wattle and daub walls that sheltered their families and livestock. The magic of this renewable resource is as compelling as the stuff of Celtic myth. This piece was inspired by the walls of Tara, the legendary seat of the Irish god-kings. The textural looping that embellishes the surface represents the lichen that covers the standing stones that remain on that sacred hill, although the walls have dissolved into the mists of time. Looping is a living legacy that dates back to the Ice Age and continues to evolve as contemporary fiber artists give it their own spin. As my students and I explore the timeless techniques of looping and coiling, we connect with the past and build bridges to the future. A cenotaph is a monument erected in honor of a person or group whose remains are buried elsewhere. 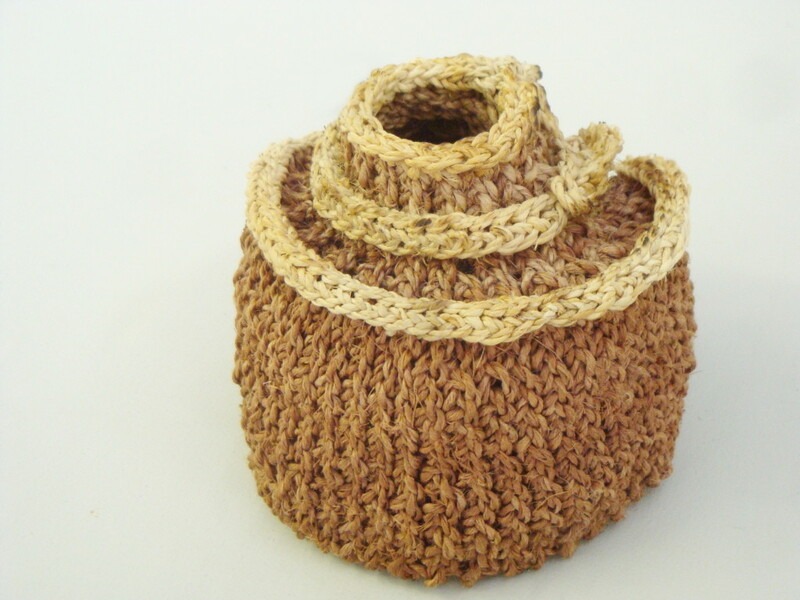 This small vessel honors the ancient ancestors who figured out how to twist and loop the fiber materials nature provided. I wanted the shape to reference burial and effigy mounds, but to suggest the type of erosion and human impacts that alter those monuments. 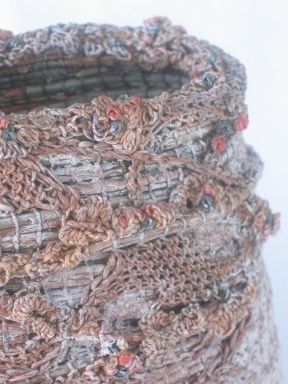 I built this vessel by cross-knit looping hand-twisted basswood bark cordage. It’s one of the primary fibers used by native people in my part of the world. The inner bark of the “string tree” can be boiled with lye or wood ash water for the red color I wanted for this piece. To take down the new-bark shine of the undyed bark fiber, I singed it with a flame. 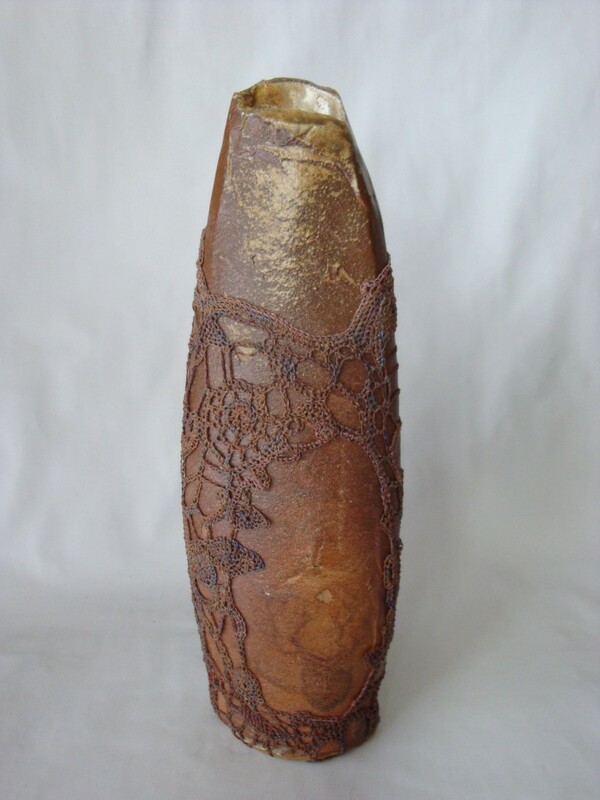 Joan Molloy Slack is a felter and a potter I got to know a few years ago when we collaborated on two pieces for a show. One of the pieces Joan sent me a piece was from her series of Standing Stones. I loved the energy of the shape, and the subtle mystery of the markings on it. For my part of the collaboration, I used looping to create a sheath that embraces the form. Some of the markings on the pottery are covered by the looping, but they’re still there, echoed in the shapes of the stitched motifs. Like mysterious artifacts of the ancient world, the power of the piece is not diminished because it’s no longer seen exactly the way it was by its creator.